Christmas is the season of cheer and goodwill, and captivates our senses. The sight of the decorations colour and playful they entice us with their glitter and sparkle, the cosy and tactile faux furs that are so soft to the touch, and how could forget, the abundance of delicious treats that delight our taste buds. But one sense that Christmas never forgets is the sense of smell, the emotions that Christmas scents provoke are warmth and happiness. Festive blends of warmed spices, a touch of nutmeg, a sprinkle of cinnamon, and the smell of a freshly cut tree, all come together to form the aroma of the season. But have you considered adding scents to your wedding day to create the ultimate experience for you and your guests? The choice of your wedding flowers could determine the scent you wish to use for your wedding day. It is great to establish an aromatic theme that remains consistent throughout; you want scents that work beautifully together, whether they are floral or herbaceous, natural aromas should always be used over artificial ones. Start as you mean to go on; ensure your invitations provide an experience, not only should they look beautiful, they should also smell divine too. Add a touch of scent to each invitation to give your guests a taste of what to expect from the big day. Many people are moving away from traditional confetti and rice toward more natural products, such as dried rose petals and lavender. Why not provide small pouches for your guests to toss at the right moment? The natural scents will grab the attention of your guests and provide a fragrant backdrop to a special moment. Many of our brides choose floral settings as their centrepieces, whilst others prefer a more contemporary display. Whichever you choose, there is always a subtle and easy way to enhance the fragrant element of your table setting. Place a sprig of herbs next to each setting, whether you choose mint, rosemary, sage or even continue with the relaxing scent of lavender, your guests will enjoy the feast that their senses are experiencing during your reception. We know that you will have chosen a mouth-watering menu for your guests, but there are some extra little touches that can be added. Summer weddings with a bowl of fresh strawberries just wouldn’t be the same without a scattering of mint leaves as a garnish. Make the scent of your wedding especially yours by designing it yourself and having it featured throughout your day. Perfume brands like Jo Malone London, Je t’aime Perfumery, Senteurs de Provence, Floris, and Sifr all allow you to customise your own special fragrance. There are many creative ways that you can add scent to your wedding day, each guided by your chosen Essex wedding venue and style of wedding. But when you are planning the look and feel of your big day, don’t forget to add some fragrant elements. The aromas you add to your wedding will ensure that memories will keep flooding back for many years to come. 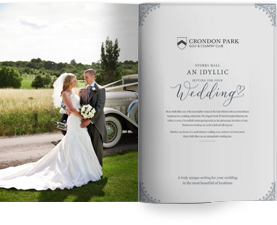 For a wedding that captivates all of your senses, contact our team at Crondon Park.